November 7-December 2 1. Laguna Beach, California Dominick Corvaisis went to sleep under a light wool blanket and a crisp white sheet, sprawled alone in his bed, but he woke elsewhere–in the darkness at the back of the large foyer closet, behind concealing coats and jackets. He was curled in the fetal position. His hands were squeezed into tight fists. The muscles in his neck and arms ached from the tension of a bad though unremembered dream. He could not recall leaving the comfort of his mattress during the night, but he was not surprised to find that he had traveled in the dark hours. It had happened on two other occasions, and recently. Dean Koontz is, hands down, one of the most influential writers on me as a person and a writer. Which was kind of an awkward thing to take into graduate school, my devoted passion for genre books and authors, particular an author who some have disparagingly referred to as a knock-off Stephen King. He seems most often compared to Stephen King because they’re both prolific authors, writing popular horror around the same time, often mining the same themes and tropes (in fact, Strangers and The Stand have always seemed to deal with many of the same elements and themes). This long-running comparison between them, at least by the fans of each writer, may be the reason that I never finished a Stephen King book till I read Carrie for a college course in 2001 (I read On Writing the next year and they remain the only books of his I’ve read). Anyway, Stephen King has the better track record when it comes to films and t.v. versions of his work and I think that actually has a lot to do with how they’re both perceived in the public consciousness. I last read Strangers around 1997-1998, so I’ll say I was 16. While it was the last time I read it, I must’ve read it at least once before that and I’ve always remembered it as my favorite of Koontz’, after Lightning. Since I’d re-read Lightning more recently (2009), I decided to re-read Strangers for this project. 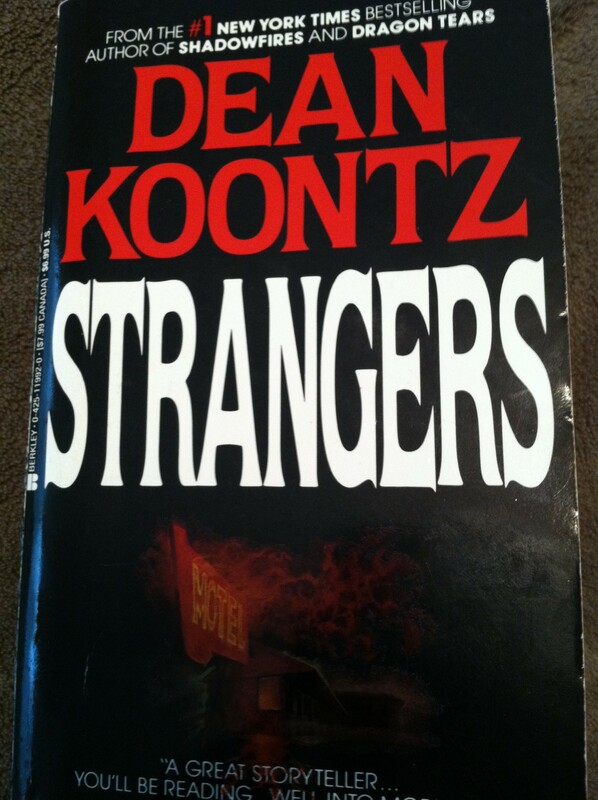 Also, Strangers helped me identify a theme of Koontz’ that I started to see in most of his books: the coming together of strangers to form a family unit. While it is most obvious in this book, you can find variations of it in pretty much all of his work. His first hardback bestseller, Strangers was published in 1986. It features 12 primary characters (according to Wikipedia, I’d say at least 4 of them are secondary characters), most of whom have 3rd person chapters from their perspective. The first half of the book focuses on these characters as their lives are falling apart because of a variety of disorders and maladies they can’t explain. It’s not till the second half of the book that almost all of the characters come together and start to figure out the puzzle of what happened to them collectively. The book was a bit dated when I was reading it in 1997-1998, but nothing like it is now. Similar to what I discovered when I re-read Lightning in 2009, I found that Strangers reads like a period story now, very much a product of its time. The story would be very different if it was set now, but I enjoyed that aspect of the story. It was a bit of a time capsule, a reminder of the way things used to be, and how drastically technology has changed the way we connect to other people since the 80s. I re-read my original paperback edition, putting some serious creases in the spine on this go-round because it took me about two weeks to read it. Yes, I have to confess, I was disappointed to find upon re-reading that I was bored for most of the first half of the book. I didn’t particularly care about the two main characters among the twelve (Dom and Ginger), who just seemed too good and uncomplicated, despite their troubles. Koontz takes about 300 pages to ratchet up the tension and I think probably 150 or 200 would’ve been more than fine, even with as many characters as he had. But once the characters started coming together, I reinvested in the story. My memories of what happened were sometimes very distinct and clear and others times very imprecise. But I remembered very early the gist of “what happened” to the characters and it was satisfying to see that I remembered correctly. However, after the long build-up about what had happened to these characters, the resolution was way too quick, almost an afterthought. I read and collected copies of all of Koontz’ books, up till about 1997 and Sole Survivor and then I didn’t read another Koontz book through most of college, according to my reading records. I re-read Oddkins in 2004 and then read The Taking the same year, and was blown away. I started listening to the Odd Thomas series on long road trips and really enjoyed Innocence last year. I think he was a prolific, but inconsistent, writer when I was a kid and first fell for his books. But now that I’m adult and comparing the early books I loved with his more recent titles, I think it’s safe to say that he’s become a better writer over the years. His characters can still tend to be a bit too black and white, “good” or “bad,” but he will always know how to tell an interesting story, build lots of tension and entertain the reader.